The Ionic is a bit of a Hail Mary pass. The smartwatch represents years of R&D and millions of dollars in acquisitions converging into one product. It’s one the company’s CEO has been talking up months before its official unveiling, pointing to it as a sign that Fitbit has fight left in it, even as the wearable industry continues to contract around it. 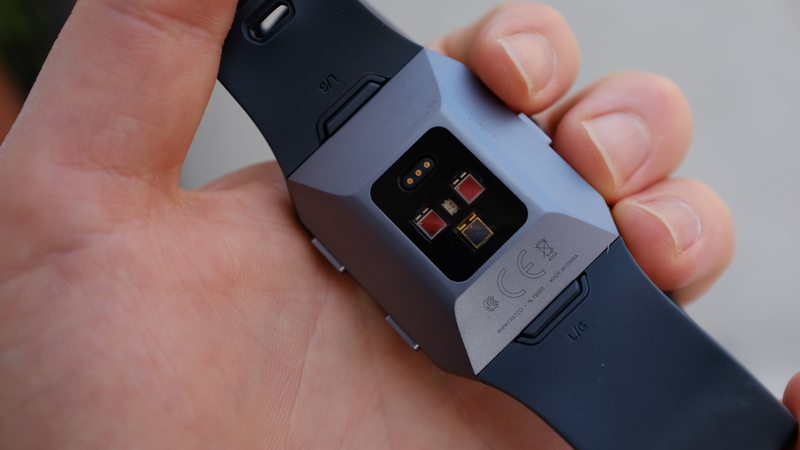 The Ionic is more fully realized than last year’s Blaze, which skirted the line between fitness band and smartwatch, thanks in no small part to the fact that Fitbit built it on top of startups like Pebble, Coin and Blaze. The company was able to draw on years of hardware and software development for the Ionic, and what holes it wasn’t able to fill itself, it spent tens of millions of dollars to find the people who could. In other words, the one company that’s really managed to make some headway in the smartwatch space has doubled down on health. Rather than working to build that functionality into its product, health and fitness are at Ionic’s core. Icons for step count, heart rate and calories burned pop up right next to the date and time when you first turn on the phone. The Ionic does your standard range of Fitbit activity things: continuous heart-rate monitoring, multi-sport tracking, swim stats (yep, it’s waterproof) and sleep monitoring. All pretty standard stuff. 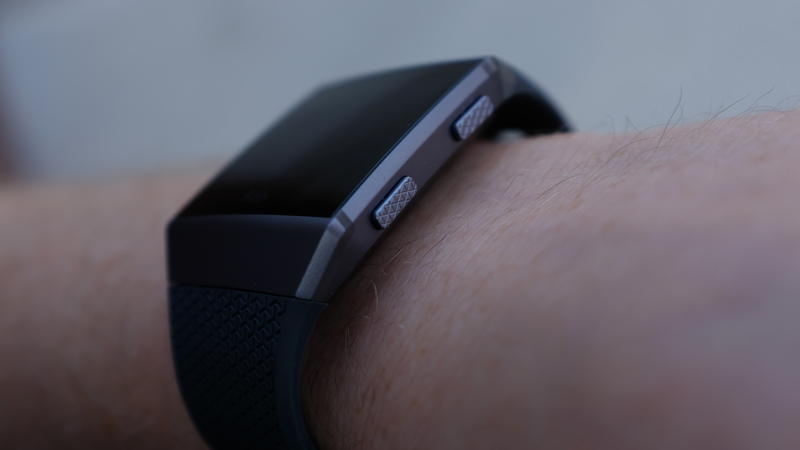 Fitbit is, however, uniquely positioned to bring some extra tricks to the device. Back in 2015, the company picked up FitStar, and has since slowly begun integrating its service into its own offerings. Starting at some unspecified time in the Fall, the company will be adding audio and video coaching to the app. It’s a nice idea — after all, the gamification of fitness can get people off the couch, but even with a baked-in social network, it only goes so far. Perhaps some proxy personal trainer will help people stay on track. The company has also promised all sorts of customization on that front, offering up routines tailored to users’ specific needs. The company definitely has the deep resources to offer that up — as it notes in its press material, Fitbit has recorded, 79 trillion steps, five billion nights of sleep and 160 billion hours of exercise in its decade-long existence. That’s a tremendous resource for determining habits and fitness routines. Though, none of that is implemented yet, and it will likely be a few months before the courses are added. As I write this, I’ve been wearing the device for two days now, but the software is still pre-production, so I can’t yet offer any sort of a deep dive on that side of things. There’s still a lot coming on that front — including, most notably, third-party apps. That, after all, is what many analysts consider to be the dividing line between souped-up fitness tracker and smartwatch. That’s the driving motivation behind the company’s Pebble purchase. 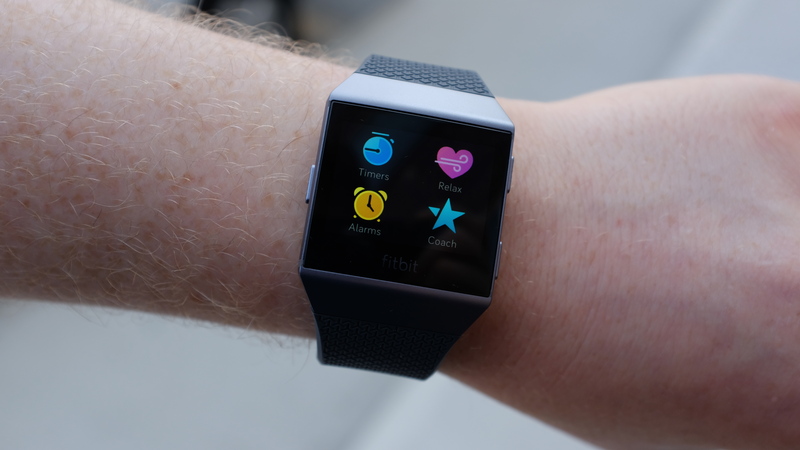 As many bummed former fans/supporters will tell you, Fitbit essentially scrapped the startup. There was some speculation around precisely how the company would incorporate the smartwatch maker, and it turns out that it was, at least for now, primarily focused on its app store/design. As is to be expected, there’s not much here in the way of apps at the moment. The company is launching with a handful of partners designed to highlight the device’s functionality. I suspect Fitbit also offered up launch exclusives in order to bring partners on board, which is why you get, say, Pandora and not Pandora and Spotify. There’s also Starbucks, to highlight the mobile payment system, and Strava for added fitness metrics. As for when more apps will begin to populate the store, that’s anyone’s guess, really. As a million manufacturers will happily tell you, launching an app store is really hard. This isn’t an Iowa cornfield. Just because you build it doesn’t mean they’ll come. 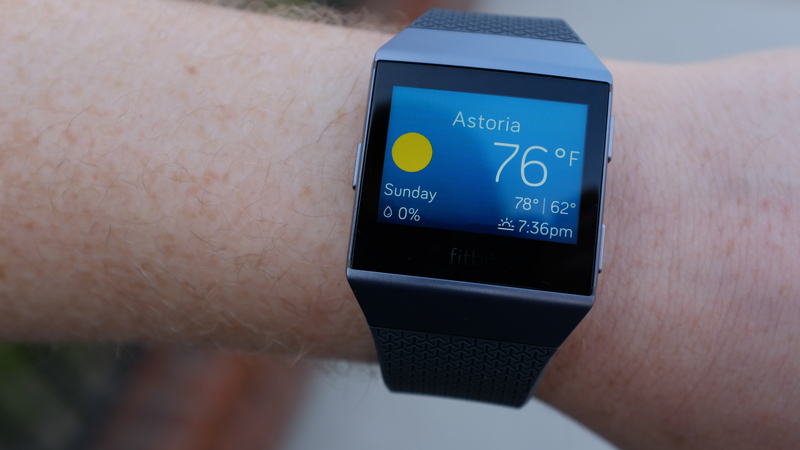 That said, Fitbit’s got the traction and the install base, so depending on how well the Ionic does out of the gate, there’s certainly a chance developers will want to get on the device — and a big part of the Pebble acquisition was creating a simple, web-based platform for developers to transfer apps to Ionic. Now, about that hardware. It does, indeed, look like the leaks suggested, which isn’t great. I will say that it actually looks better in person. I guess some gadgets, like people, just don’t photograph well. The Ionic’s looks are also dependent, in part, on the color scheme. Fitbit has some weird internal logic that ties them all to space themes. I won’t go into that now, except to say that the orange and blue has something to do with a convergence of Earth and Mars (no joke). But all you really need to know is that it’s a convergence of ugly. The black and gray options are much better looking and suited to the product’s design minimalism. The watch has a long, flat design, which curves almost imperceptively, to better fit on a wrist. 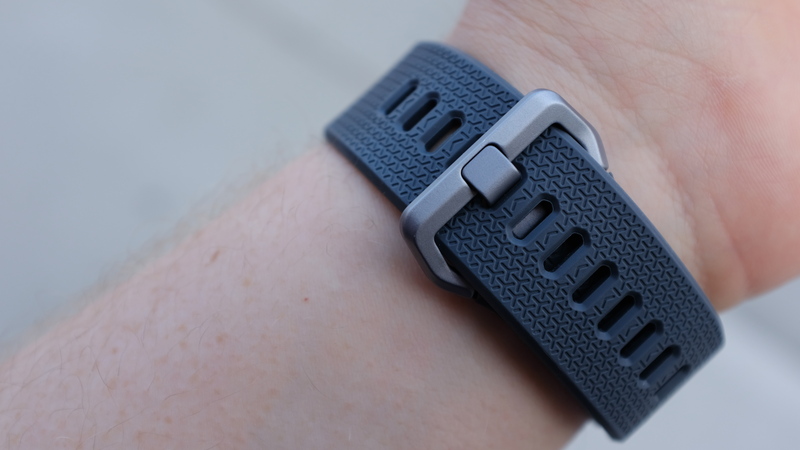 I’ve been wearing it with the default silicone band and find it pretty comfortable. It’s big, though. I’m around six feet tall and try to be mindful of the fact that not everyone is. Smartwatches often neglect to accommodate smaller users, but I did expect Fitbit to be mindful of the substantial number of women in its user base. We’ll be letting a female user test the product, as well, to get a better idea of the fit, but from a cursory glance, the product may be too big for many wrists. Given the state of the wearable industry, a smartwatch doesn’t seem like the logical next step for Fitbit. After all, the company was recently eclipsed by Xiaomi in wearable sales for the first time ever, a fact that many commenters have rightly suggested is driven by pricing. It’s hard to compete with a company that is offering a $15 wrist-worn tracker, but if anyone is positioned to do so, it’s probably Fitbit. Instead, the company is taking the opposite approach. 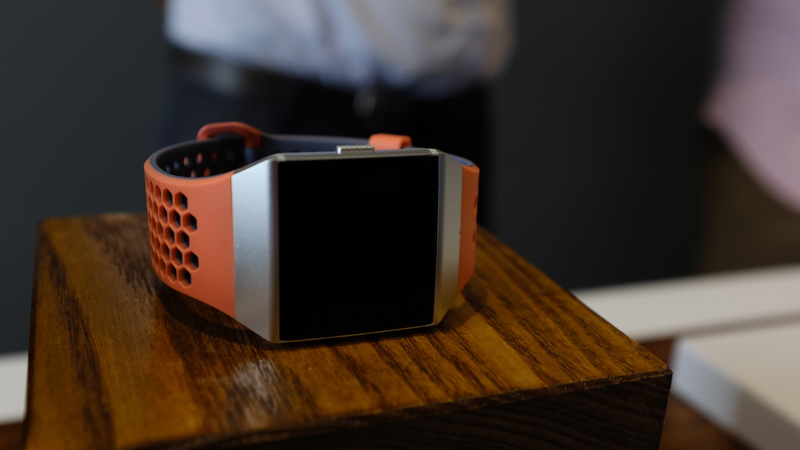 And that said, the Ionic’s $299 price point is actually pretty aggressive as far as smartwatches go. It’s $100 more than the Blaze, but it’s a fair bit less than offerings from Apple and Samsung. And there’s certainly the makings of a solid offering here, including a promised four days of battery life — an extremely appealing proposition for a fully functioning smartwatch. I can’t wait to put that to the test. Stay tuned for a review.